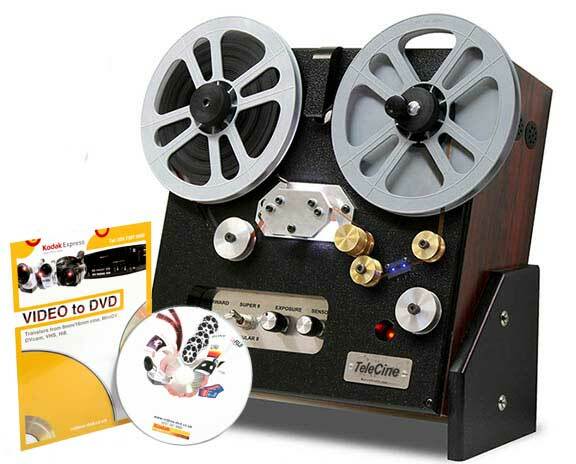 Transfer, copy and conversion of Super 8, Standard 8mm, 16mm and 9.5mm cine film to DVD and Editable File Formats. We are a specialist cine and video business within the Kodak Express and as such customers can shop with us with complete peace of mind knowing that we operate under the Kodak umbrella of superlative customer service and unparalleled quality. We have been encoding and transferring cine film footage to DVD and digital file formats for over 15 years. Data scanning technology has made significant advances over the years enabling top quality film scanning at a cost that suits most budgets. With continual investment in the latest innovative technology, we keep ourselves at the cutting edge of telecine advances. Cine film conversions to DVD and digital files are done onsite at our London studios by our knowledgeable and friendly staff. Cine films are prone to degrade over time. There are several different factors that cause this. With colour films in particular, the colour dyes are unstable and often show an overall shift in colour resulting in a magenta caste. Agfa cine film is particularly prone to this. Our cutting edge equipment allows our technicians to adjust the colour balance as the film is being scanned, returning the colours back as normal as possible. This is a far superior method than adjusting the colour balance in post production. We will assess your cine film for damage and cleanliness FREE OF CHARGE. Most films need no more than a quick puff of air to remove dust and hairs and the occasional resplicing. Occasionally, we are sent cine film which is in really poor condition - very brittle, smelling of vinegar and sometimes covered in mould. When this happens, we will contact you to discuss the best cause of action. Instead of encoded DVDs for watching on your TV system, you can choose to have digital files for computer editing. Each minute of cine film takes up 1 gigabytes so the files will need to go on a USB hard-drive or large capacity USB stick. You can provide your own, or buy one of ours. There were two types of 8mm cine film in popular use up to the 80's. Regular 8mm film has sprocket holes which are larger and almost square, whereas the holes in Super 8mm are elongated and smaller. They both measure 8mm across, hence the name. Cine film with sound has a distinctive copper coloured stripe running along the edge of the edge of the film on one or both sides. 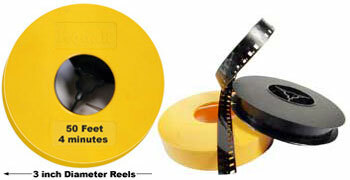 Shown below is the most popular type of Super 8 and Standard 8mm reel. Measuring the diameter of the cine reel is the easiest way to find out both the running time and the film footage. Please note that running times are approximate. Standard 8mm film transfer - "I was anxious with letting my Standard 8mm and Super 8 cine film out of my sight but I need not have worried. My cine films, DVD and digital copies arrived safe and sound through the post. The quality was was way beyond my expectations. Now that I have found you, I will be sending you another batch of films to do. Thank you"
8mm cine film transfer starts at just £11/reel. 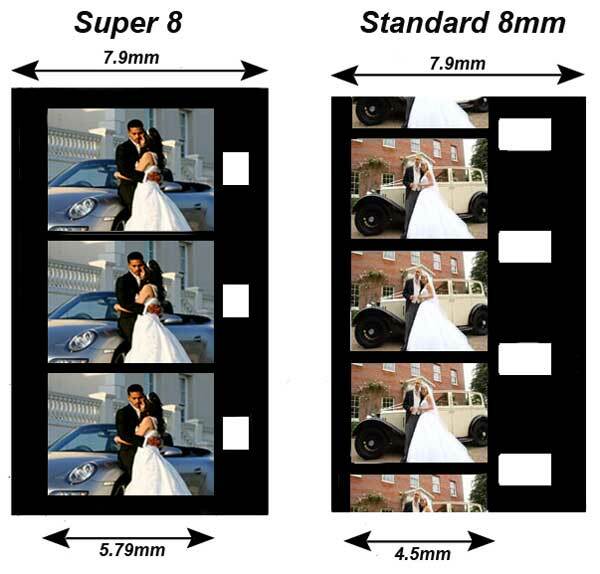 If you don't know what format of cine film you have, it is very likely to be Super 8 or Standard 8mm. Don't worry if your reels are not completely full, we will only charge for the actual cine footage. For full details of 8mm cine cost download our PDF price guide. Most amateur cine film comes without sound. However, if you see a magnetic brown stripe running down the edge of the film there maybe sound on the film. There is no extra charge for cine film with sound. If required, we can also add background music to cine film transfers at very affordable prices. We are part of the Kodak Express group specialising in Video Tape and Cine film transfer to DVD. Cine transfers normally take about one to two weeks, depending on the size of the job. Cine transfers make excellent presents so if you are thinking about getting some done for Christmas, we advise customers to get the footage to us a early as possible - don't leave it to the last moment. Should you need your cine transfers urgently, we can normally meet ANY deadline. Rest assured that your cine film will receive superlative care and returned safely to you. We have more than 15 years experience working with cine film of all types including Kodak Kodachrome, Fuji, Agfa, Polavision, Ilford and Boots.